Darkspore may have stolen the show at Electronic Arts’ Tuesday presentation. And EA Mobile’s lineup of upcoming games should keep iPhone and iPad gamers occupied for months. But EA also unveiled some other promising projects that Mac gamers should pay attention to. While only The Sims 3: Late Night has been confirmed for Mac OS X, there’s a good shot Mac gamers will get to see some of the other titles on the Mac in the near future. First, the obvious: The Sims 3 have a new expansion pack and yes, it will be playable on the Mac. Over the last year, your Sims have furthered their careers. They’ve spruced up their apartments. They’ve traveled to faraway lands. Now, they want a nightlife. Late Night is the latest expansion for the ever-popular people simulator. This time, your Sims can go to bars, night clubs, and become undead. Not only can you unlock new careers (like bartender) and traits, but you can also become part of a vampire family. Details are sparse at this point, but with the popularity of vampire-lore in American culture right now, it’s not entirely surprising that the Sims have introduced bloodlines to the mix. Let’s also hope you can improve your martial arts skills and slay the annoying bloodsuckers. 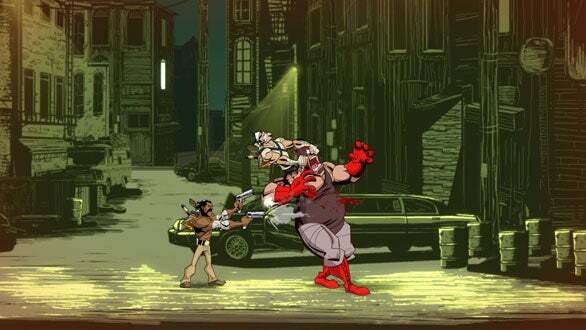 EA is publishing Shank, an old school violent 2D side-scroller by independent developer Klei. Shank has already received a lot of buzz and early awards, earning Best of E3 nominations from Kotaku and IGN. At a demo session after the presentation, I was able to play through a co-op prologue level and get my picture drawn by Shank’s creative lead, Jeff Agala. Shank is primarily a single-player game, but the demo level was a two-player co-op mission that featured Shank and his tattooed, mustached friend battling their way over rooftops and into a crowded bar. Eventually, they confront a boss by the name of The Masked Butcher. The resulting battle was an old-school throwback to the days of exploding barrels and huge, lunging bosses. Despite having an impressive arsenal of moves and weapons, controlling Shank and stringing together long combos was surprisingly easy. I was able to fire my twin pistols at an advancing foe and then leap into the air before finishing him off with my two blades. Later, my partner flipped me onto a high up perch where I was able to throw, stab, and shoot my way through a variety of baddies. Currently, Shank is only scheduled to be released on the Playstation Network, Xbox Live Arcade, and Windows. Let’s hope Klei decides to port the game to Steam, OnLive, or directly to the Mac. Independent developers and EA have a good history of taking their games to the Mac, so don’t be too surprised if you see Shank slicing his way onto your screen sometime soon. Usually when you see a former sporting great on stage at a gaming event, they’re there as a hired spokesperson for whatever sporting company has hired them to endorse their product. They say a few words but rarely even play the game they’re supposed to promote. But seeing Curt Schilling, a former Major League Bassball pitcher, walk on stage was something very different. Schilling is the founder of 38 Studios, a massive-multiplayer online role-playing game-focused company that already has achieved a great deal of buzz—despite not producing a game yet. The reason for the buzz? Schilling’s team includes veteran sci-fi writer R.A. Salvatore, cartoonist and Spawn creator Todd McFarlane, and designer Ken Rolston, known for his work with the Elder Scroll series. That’s a lot of talent for such a small studio. The world-premiere teaser trailer was directed by McFarlane, who heads up the art. The teaser featured your typical ominous voice-over about the inevitability of death while the screen showed a knight hacking to bits a number of skeletal warriors. The entire look is either very classic or very common, depending on your perspective. The amount of talent on the staff means that the company is well acquainted with fantasy tropes, so it’ll be interesting to see how they breathe new life into the genre. 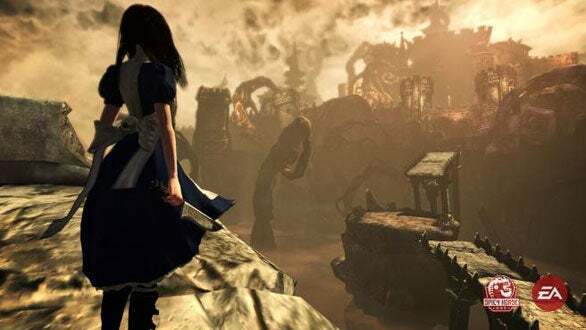 American McGee’s Alice was a action/horror title with an art style and aesthetic that makes Tim Burton look like Charles Schultz. Dark, twisted, and perfectly blending psychological and visual horror, Alice achieved a cult following and widespread critical success. Rumors swirl of a movie adaptation of the original Alice game, but in the meantime, Spicy Horse is developing a sequel, due out in 2011. The original screens indicate a leap forward graphically while still maintaining McGee’s unique visual style. Hopefully the sequel will expand upon the twisted version of Wonderland and also be available for Mac users.